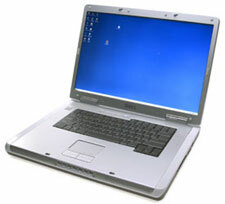 Dell Inspiron E1705 notebook computer is a desktop replacement entertainment laptop which powered with Intel Core Duo processor and runs on Windows XP Media Center Edition. Dell E1705 also features 17-inch widescreen XGA+ LCD (upgradable to UltraSharp Wide Screen UXGA with TrueLife), Intel Graphics Media Accelerator 950 (or upgrade to 256MB DDR NVIDIA GeForceTM Go 7800) and Dual Channel 667MHz DDR2 memory for enhanced multimedia experience. CNet (link dead) reviewed Dell Inspiron E1705 and gave a rating of 7.8 out of 10 (Very Good). CNet likes excellent overall performance and competent gaming performance, complete set of multimedia controls and connections, quality speakers, runs Windows XP Media Center and features double-layer DVD burner. The bad points are lacks of integrated TV tuner, though a PC Card tuner is available. CNet concluded that Dell Inspiron E1705 packs a solid set of multimedia features, and when configured with Intel’s Core Duo processor, it has enough power to speed through virtually any task, from editing video to playing games. PC Magazine meanwhile rated Dell E1705 4 out of 5 (Very Good) and concluded that the E1705 has just the right combination of performance, high-end components, and reasonable price. Hard-core gamers should still look toward the XPS M170, but the E1705 does give multimedia mavens a reason to invest in the future and Inspiron 9300 owners something to salivate over. They felt that the laptop was good for its new Intel dual-core components, great instant-on feature, good performance and six USB ports, while a bit letdown on base gets hot, short battery life and a bit heavy. PC World (link dead) also tested Dell Inspiron E1705 and gave a score of 79 (Good) and concluded that Dell’s first dual-core offering is both a workhorse and a multimedia star. It isn’t cheap but no other notebook in its class does a better job of providing instant entertainment on a 17-inch screen. Laptop Magazine (link dead) gave a rating of 4 out of 5 and concluded that other than the lack of a numeric keypad to the right of the keyboard (even though there,s room for one) and the fact that the underside of this notebook runs a bit hot, the E1705 is an ideal desktop replacement.